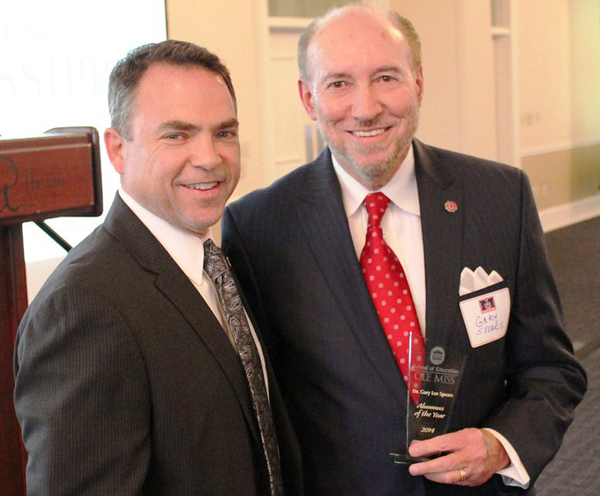 During the spring 2014 semester, The School of Engineering, The Patterson School of Accountancy, The School of Pharmacy, The School of Law, The School of Applied Sciences and The School of Education all recognized Ole Miss alumni for their outstanding work and achievement. The Law Alumni Hall of Fame banquet was held March 22, 2014. 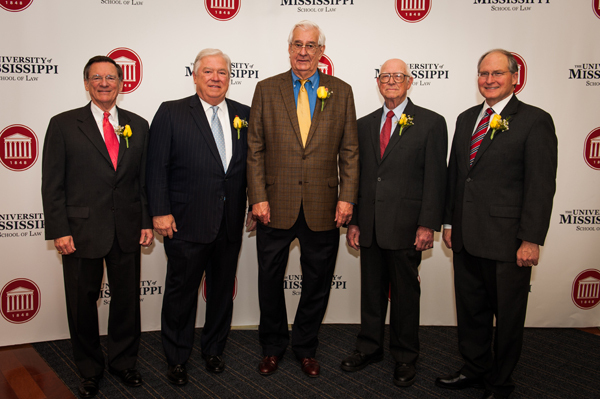 Those inducted into this year’s class were (left to right): Lee Davis Thames, Sr. (BA 58, LLB 60), Haley R. Barbour (JD 73), Brad J. Dye, Jr. (BBA 56, LLB 59), Fred Wicker (LLB 48) and William L. Waller (LLB 50), represented by his son, Chief Justice Bill Waller (JD 77). 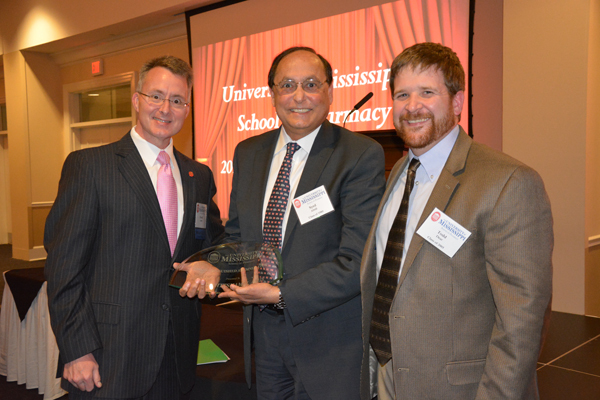 The School of Pharmacy presented its Distinguished Alumnus Award to Dr. Syed Abidi (MS 77, PhD 80) on April 5, 2014. Presenting the award to Abidi are Dean David Allen and Pharmacy Alumni Chapter president Dr. Todd Dear (BSPh 03, PharmD 05). 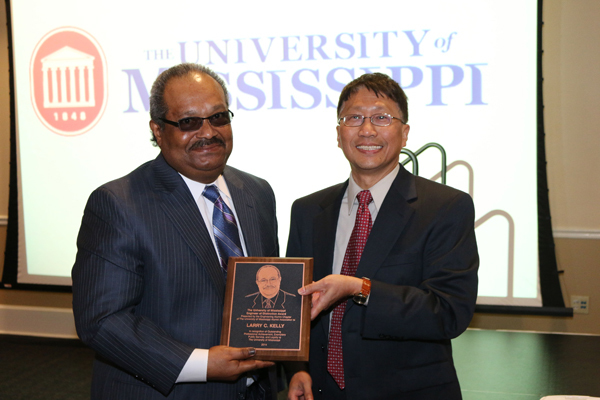 The School of Engineering presented its 2014 Service Award to Julius M. Ridgway (BSGE 56) on April 3, 2014. 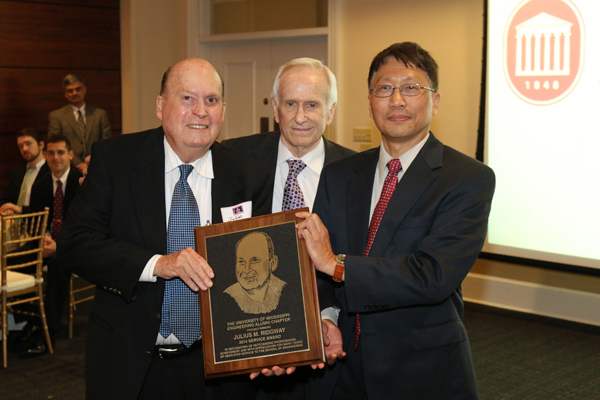 Presenting the award to Ridgway are Jim Barnette (BSCVE 59) and Dean Alex Cheng. The School of Engineering presented its 2014 Engineer of Distinction Award to Larry C. Kelly (BSCHE 79) on April 3, 2014. Presenting the award to Kelly is Dean Alex Cheng. The Patterson School of Accountancy presented its 2014 Patterson School of Accountancy Hall of Fame Award to Roland Burns (BAccy 82, MAccy 82) on April 24, 2014. 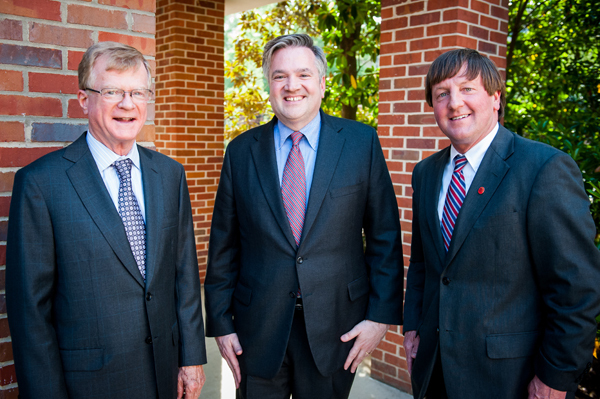 Pictured with Burns is Dr. James Davis (BBA 62, MS 63, PhD 72) and Dean Mark Wilder. 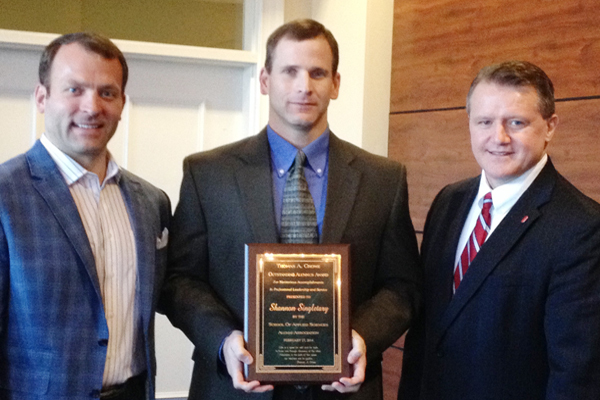 The School of Applied Sciences presented its 2014 Alumnus of the Year Award to Dr. Shannon Singletary (BSES 95, BS 97, DPT 05), senior associate director for sports medicine at the University of Mississippi, on February 27, 2014. Presenting the award to Singletary is Athletics Director Ross Bjork and Dean Velmer Burton. The School of Education presented its 2014 Alumnus of the Year Award to Dr. Gary Lee Spears (EdD 91), president of Northwest Community College, on May 9, 2014. Presenting the award to Spears is Dean David Rock.